Order Freedom Vegan Marshmallows Vanilla from the Online Health Food Store UK. 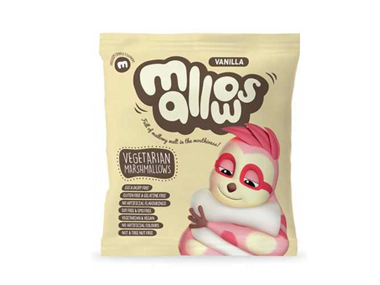 Buy Freedom Vegetarian and Vegan Marshmallows - vanilla and other quality Sweets safely online in the UK. Vanilla mallows; vegetarian, vegan, gelatine free, gluten free and still delicious! Mouthwatering, soft and delicious vegetarian and vegan marshmallows with vanilla flavour. Our UK Health Shop sells real Freedom and other Sweets from top-quality brands safely online to customers throughout the United Kingdom in England, Wales, Scotland and Northern-Ireland. View more products on the Online Health Food Store from Freedom. Where to buy Freedom Vegan Marshmallows Vanilla safely online? Shop at the Online Health Food Store if you are wondering where you can buy Freedom Vegetarian and Vegan Marshmallows - vanilla safely online in the United Kingdom. Our Health Shop is located in the UK and our award-winning independent has been serving customers in England, Wales, Scotland and Northern-Ireland since 1976. You can buy our Sweets online and we post out orders to any UK address. Vegan Marshmallows Vanilla - Freedom Vegetarian and Vegan Marshmallows - vanilla in Sweets and Confectionery.